Shawnee Fire Department and Ohio State Patrol were on the scene of a tractor-semitrailer jackknifed on Interstate 75 at the 121 exit on Tuesday. The crash is under investigation. LIMA — A commercial semi-truck rollover closed down one lane on southbound Interstate 75 near exit 121 around 2 p.m. Tuesday after careening off the side of the road due to hazardous conditions caused by Tuesday’s rain storm. 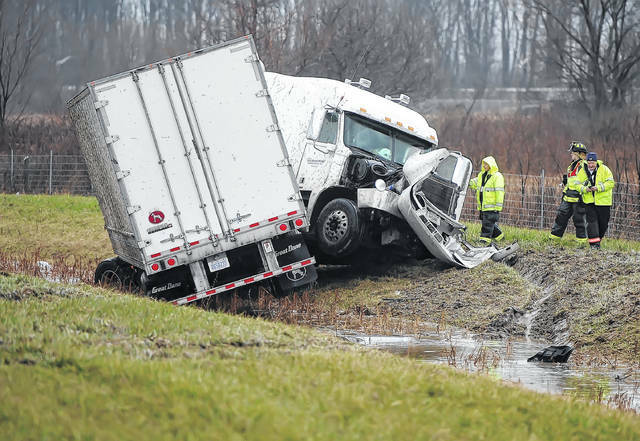 The driver of the semi, Mark Clark, 63, of Warren, Mich., was uninjured. According to Sgt. Steve Posada of the Ohio State Highway Patrol, the driver said he was driving the posted speed and hydroplaned. Shawnee Township Fire and EMS also responded to the scene of the accident.